The artist Imaani recorded a version of Where Are You for the 1998 Eurovision Song Contest, and Cray heard the song on trailers of the show early that year. Hit And Run denied there was any infringement of copyright, and countered that there was no trace of Cray’s song within theirs. Cray met Johnny Stirling of Hit And Run in 1995. She played him her song Where Are You Now. He liked it and paid for some demo recordings to be made of it. The trial involved various disputes between Cray and English over events surrounding the recordings. When Cray bought a copy of the 1998 Imaani recording that she considered to infringe her song, she saw Johnny Stirling named as producer, and one Simon Stirling as a co-writer. She alleged that she was introduced to Simon Stirling by Johnny at the Hit And Run offices, but this was disputed at trial. Evidence of expert musicologists was relied upon: Professor Roderick Swanston of the Royal College of Music for the claimant, and Mr Peter Oxendale, a respected expert witness, composer and musical director, for the defendant. Kitchin noted that their evidence was reliable, but that (inevitably perhaps) there was disagreement over the extent of the similarity between the two musical works. This concerned the titles, the notes of the melody, the content of the lyrics and the “story”. The claimants argued that some common themes existed in the lyrics. The claimant’s song used “autumn leaves fall gently to the ground”, while the Hit And Run song had “leaves are falling in the park”. “Trapped by these thoughts of you” in the original, was considered similar to “you’re in my mind all the time . . . unlock these chains” in the defendant’s song. Again, the judge agreed that these verbal images were “commonly used” in pop music, and the experts agreed that they were not original to Cray. The similarity in the melodic ‘hook’ was also explained by Oxendale as commonplace, being the first three notes of the minor scale. The judge concluded on this point that “save for the hook line I do not believe they have any significant similarity”. On comparing the two scores presented below, the claims put forward by Cray do appear quite tenuous. Her reliance on the coincidence of just the final three notes of the ‘melodic hook’ was easily dismissed as being commonplace in music, containing as it does the first three notes of the A minor scale. Similarly the use of just three chords in each piece – what are known as the tonic (first chord), subdominant (fourth) and dominant (fifth) – are the most common chords employed in modern Western music. 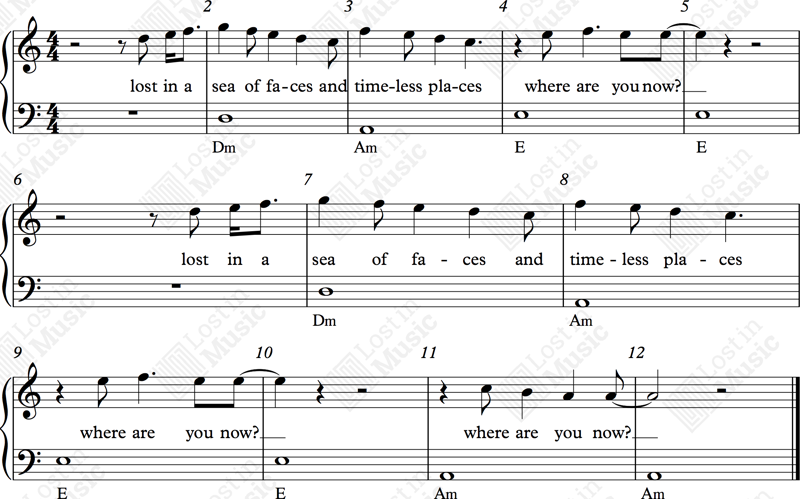 The scores illustrate the music of the two songs, with the “melodic hook” in the final two bars of each extract. The Hit And Run version is transposed up a tone to facilitate comparison. Sound recording for Creagh to follow. (Manikiza, Stirling, English) © Warner Chappell Music Ltd/Hit And Run Music (Publishing) Ltd/Philip Manikiza. Recording by Imaani ℗ 1998, EMI Records (here transposed up from G minor original for ease of comparison). The trial judge, Mr Justice Kitchin referred to two cases in order to consider whether a substantial part of the original work had been taken. In Ladbroke (Football) Ltd v William Hill (Football) Ltd it had been established by Lord Justice Reid that the quality of what was taken was more important than the quantity. Lord Justice Scott, in Designers Guild Ltd v Russell Williams (Textiles) Ltd considered how much of the “independent skill and labour” of the original had been incorporated in the infringing work, and also which elements of a copyright work are unprotectable because they are commonplace. He stated that the claimant must prove that the allegedly infringing elements were copied, either directly or indirectly, from the original. If the similarities “raise an inference of copying”, then it is down to the defendant to prove that they did not result from copying. On the likelihood of copying, Kitchin concluded that the similarities between the two works were “not sufficiently close, numerous or extensive as to be more likely the result of copying than coincidence”. On the question of access he accepted the three co-writers’ account of the creation of the song Where Are You at Simon Stirling’s studio, and that they did not have direct access to a recording of Cray’s song. And on the question of whether the similarities amounted to a substantial part of the works, the judge ruled that, taking into account the proportion of commonplace and non-original content in the lyrics and the melody, the similarities could not be considered substantial, and therefore the infringement claim must fail. Peter Oxendale offered some context to the coincidence of the similar titles by revealing that the PRS database in the UK had over 150 works with the title Where Are You and a similar number with Where Are You Now. Double this number of each was registered with the US Library of Congress. The phrases were clearly commonplace in popular music.